My VMUG tour for 2019 continued in March with a trip up to Manchester. However, this was a bit different, I was presenting this time. The week before the event a colleague reached out to ask if I would be available to cover his slot, at first it seemed like a terrible idea. I ran through all of the excuses I could think of not to present, and realised that they where all rubbish, so said yes. 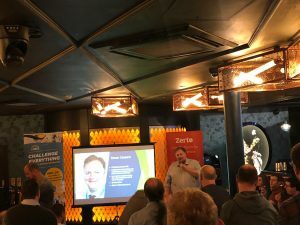 The NW VMUG was held at the Dirty Martini in the Deansgate area of Manchester, a new venue for the event – not that you would know it, the VMUG leaders had everything prepared and the event ran smoothly. Even a delay in the lunchtime chicken order couldn’t upset moods. Not only was I on the same agenda as the VMware CTO, I’d somehow managed to be assigned the spot after him and after lunch, no pressure then! The presentation I gave focused on my time working on a large scale migration. What I learnt, how I went about setting the project up and trying to avoid any the technical discussion or get drawn into creating solutions. I hate how quickly people in IT jump to solutions, all too often people ignore the problem and focus on deploying new technology, regardless of its organisational value. I also included a demonstration of how to use a simple visualisation to go through the data, information, knowledge & wisdom model. I think the session went well, and feedback to date has been positive. When I think back, I think for the next session I’ll focus more on building a better narrative and learning the delivery of that, to remove the dependance on my notes. Without wishing to sound cliched, it really is the case that if I can get up and present at a VMUG anybody can.